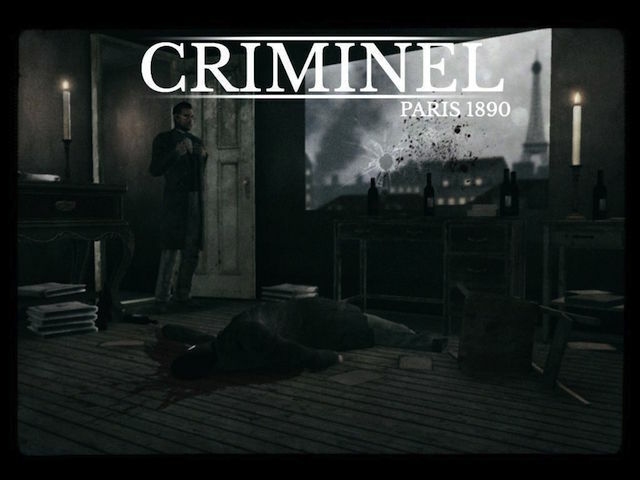 The game asks players to solve a series of gruesome murders in 19th Century Paris. 4PM Games has announced the launch of its debut title on iPad devices: Criminel. The game is a noir detective mystery, asking players to solve a series of murders set in 19th Century Paris. To do so, players will take photographs of each crime scene to find clues, will examine witness testimonies for additional details, and more. At the beginning of each investigation, players walk around dimly lit environments, taking pictures of key items, as highlighted by the game. That is, players will tap to walk around, and can swipe to move their camera view. When they’ve spotted a key piece of evidence, the game highlights it and players take a picture. Each environment has a specific number of clues, and players can ask their coworker for advice on where to find the next piece of evidence, if they can’t find it on their own. Back at the station, players read the testimony of a witness or bystander, and tap on key words to add notes to their notepad. For instance, the witness may have seen a tall man fleeing from the scene. Players would tap on the word “tall” to add it to their notepad and continue. Finally, players are shown a list of possible suspects, and must compare their notes and observations to each suspect’s stats to reveal the killer. As players progress, the story becomes more complex, as players eventually uncover a conspiracy in this thriller-inspired storyline. Criminel is something very different for the App Store. We like to think we’re going where few other developers have gone before with the look and gameplay of this title. We know we have created a unique world for gamers to explore and engage with, and we’re really looking forwards to getting it in their hands for the first time. Criminel was designed with the help of Wellcome Trust, a global charitable foundation whose “Forensics: The Anatomy of Crime” exhibition in London examines the history, science and art of forensics. Criminel will be available to play at the exhibition, which runs until June 1. The game will help illustrate to attendees how forensic science has influenced police work since the 1900s. Criminel is available to download for $1.99 on the iTunes App Store. The game is rated for users aged 17+, due to its realistic violence.